Office construction has a reputation for material wastage with associated financial and environmental consequences. This research examines the emergence of new technologies and the extent to which they can help to reduce waste in office construction. This study has been undertaken by Arup on behalf of the BCO. Focusing on Virtual Reality and 3D Printing, this report examines the extent to which the emergence of new technologies can help reduce waste during the design and construction process and identifies opportunities and challenges for the future. 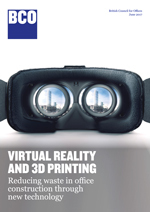 In terms of Virtual Reality, the report tests the extent to which the technology could solve the problem of wasteful category A fit outs installed by developers but dismantled by occupiers. Furthermore, it looks at opportunities to reduce waste in terms of both materials and time. 3D Printing is another technology that has been around for a while, but has seen momentum only recently. The report’s objective is to look at how this technology could potentially revolutionise the industry.